This 16X11 casserole pan has not been used often because it is oversized. I would never use your brand again for fear I would end up eating the coating. aftre first use coating started to come off. have used maybe 3-4 times. used it to make a meat loaf the other day. washed it , more coating coming off. now there are rust spots. also some bubbling in the rest off the coating. can't and won't use again. waste of money. My round Baker's secret pans are a workhorse! I really like these pans. I brought them on sale at Kroger. I use them often, and they are holding up very well! Performance You really can't ask for a better baking or broiling pan. This product is a non stick product, but I prefer to use a cooking spray. Ease of Cleaning There isn't much of a clean up, being that they are non stick. But I notice when I spray too much cooking spray, that will bake on to the surface where there may not be any food. Durability This product can be long lasting. I really cannot see any other outcome. Design I like the design. I have baked several desserts in them. It's just the right size for a pie. Doesn't Stick For extra protection from sticking if you are baking, use cooking spray. Bakers secret nonstick pans are the best quality around ! They are very durable and clean up is easy. They are truly nonstick, so everything you bake turns out perfect. If you watch sales, you can purchase them sometimes as buy 1 get 1 free. These also make great gifts for those just starting out in life. They will last many years. Non stick, great bake wear. So easy to clean. Non stick bake wear. 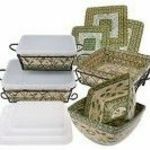 When you buy these you get everything you need for baking, cake pans, muffin tins, casserole, and pizza pans. Performance They heat evenly. Ease of Cleaning Just soap & water. Doesn't Stick Cakes & muffins come right out. 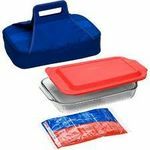 A long time ago I made a decision to not use aluminum bakeware and stick free bakeware, as I felt that the plastics and chemicals and aluminum were all not good over time for the body and health. 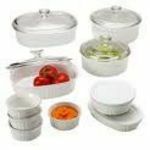 All of this went very well for years as we have a large collection of glass bakeware, Corningware, stainless steel, and cast iron. We tried a few silicone things but didn't like them. Then things changed when we got a lovely apple tree that is rare. We wanted to make lots of apple pies to freeze, and glass was not practical,. We purchased a large amount of pie tins including Bakers Secret Nonstick pie pans because they work well to freeze pies in. When they are frozen, pop the pie out, put it in a ziplock bag and then when it is time to bake, put it back in the pan and bake it. Performance Not sticking in the freezer as well as in the oven is key for making pies. We use whole grain pie crust that we grind ourselves so it is especially important to have non stick bakeware not stick. After baking it comes out very well too which we enjoy. Ease of Cleaning Very easy to clean- no scrubbing necessary. Durability We have had our pans for about four years now and so far they are holding up very well to being put in the freezer and then having the frozen pie put back in them to bake. Design I wish they were a little bit deeper, but the design is great for fitting the frozen pies into a ziplock freezer bag. Any bigger and I don't think they would fit! Doesn't Stick Great stick free performance in freezer and after baking too. Baker's Secret is a brand I would purchase again. I recently decided to start making mini-muffins and decided to buy a mini muffin pan from Baker's Secret after reading reviews on various brands and types. Baker's Secret price was very reasonable, and so far I am very happy. I bought a 24 cup muffin pan from Baker's Secret, which I think was a great idea compared to the smaller 12 muffin sheets because it saves me time (I don't have to do multiple batches). I've owned this Baker's Secret product for less than a month and have already used it 10 times, to make everything from blueberry muffins to strawberry cupcakes (next up is brownie bites). This mini muffin sheet is very easy to clean, and can be put into the dishwasher without any issues. The only con I can think of is user error. I tend to try to make big mini muffins (what an oxymoron huh?) and sometimes the oversized tops of the muffins or cupcakes stick to the top of the sheet and break off the tops of my muffins. I think this could be corrected by not filling the cups as much or spraying a nonstick spray on the top. Bakers Secret Nonstick Bakeware are great for baking! I am the baker of the family so when we have a get together's or a party I bring the baked goods. I have the cake pan, cookie sheet, and muffin pan. 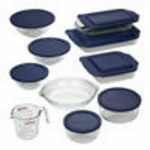 I bake many cakes and they come out perfect when I use the **Bakers Secret Nonstick Bakeware**. They are very affordable. I also use the muffin pan to do my blueberry muffins that my kids love. The nonstick works very well as my baked goods come out not sticking to the pan. Highly recommended! I use my Bakers Secret Nonstick Muffin Crown Pans every week. I love the depth of these muffin pans because they are thin and all more of the batter to be crusty like the top of a muffin. I do not always use these pans for muffins either. I use them to make cookies and mini cakes as well. I love to experiment with baking, trying different recipes and different shaped items. That is one reason that these pans are so handy. Probably the best part about the pans is the nonstick surface. The muffins lift right out and the cookies slide right out of the holes. 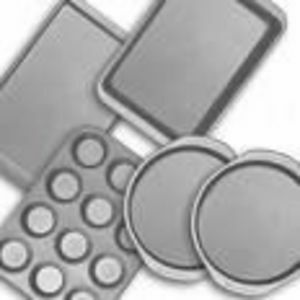 Because the depth of the pans are so thin, it does not take as long for the product to bake regardless of whether is is a muffin, a cookie or other item. I have two different sizes of muffin tins as well. The larger pan has six holes that are about 4" in diameter. This makes large muffin tops or large cookies. The other pan has 12 holes that are about 2 1/2" in diameter. I love and use both sizes regularly.